Synthetic Leather Plant Equipment - Shine Kon Enterprise CO., LTD. 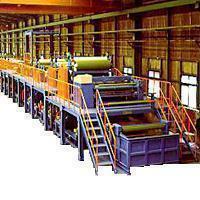 The design and manufacturing of plant equipment is based on customers' requirement and demand. Design to perform pre-making processing such as base fabric ironing, dipping and coating, this unit can operate variably according to different processed articles. The special-designed coagulating tank enables DMF to efficiently exchange with water. The washing tank allows DMF to be completely released,preventing synthetic leather from crinkling and edges from curling.